Additional Information: A very large Bongo Funerary Figural Trumpet ! The offered figure is hollowed and has a small circular opening in the torso as seen on many African large figural trumpets, including those found in Sudan and in Uganda. 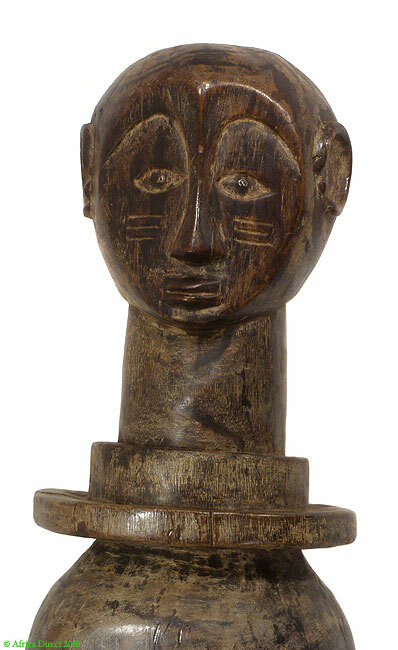 Bongo Figural trumpets such as this are uncommon in collections. This particular example would be a major addition to a collection. The Bongo lived in the southern part of the province of Bahr-el-Ghazal in the grasslands of SOuthern Sudan.. At one time the Bongo comprised a large ethnic grouping numbering in the hundreds of thousands living in this region during the middle of the nineteenth century. However through time and the migrations of peoples and under the pressure of Moslem slave traders their numbers were reduced to less than a few thousand by the middle of the twentieth century and today they are spread in different regions of the Sudan with little attention or singular identity. In the past the Bongo honored heroic warriors or hunters with sculpted grave markers known as Ngya, placed over their burials within a small fenced in compound during a ceremony a year after their death to insure that they were well received into the village of the ancestors. The shape of the memorial markers range from fully naturalistic bodies to abstracted figures as in this example or figures were shown as a combination of both figural and abstract representations. It is recorded that the abstracted shapes under the head represented the number of enemies or large animals that the individual killed during their lifetime reflecting the prestige and status accrued by these heroic accomplishments. The level of abstraction in this figure is truly amazing extending to the subtlety to the 'heart-shaped' and rounded face with scarification patterns on the cheeks. The round abstracted shape defining the body with two platter like forms defining the separation between neck and body. Seligman, C.G., ‘A Bongo Funerary Figure’, Man, 18., no. 67, 1917. pp. 97-98. Evans-Pritchard, E.E., ‘The Bongo’ Sudan Notes and Records, 12, 1929. pp. 1-61.